First the MRT packed then frequent breakdown, then property prices escalating, COE prices shot through the roof, then the China workers’ strike followed by Indian workers’ riots, the latest symtops to show up is the poor planning management of the healthcare system, not only the beds are not enough to cater for the explosion of population, the queues at the various hospitals and specialist clinics are see record number of patients, the Government also “suddenly realise” that we need to another 20000 healthcare workers. Talk about poor planning and foresight, this is one lesson that any developing or developed countries should not learn from Singapore! I am a glaucoma patient and have noticed that my check-up intervals at the Singapore National Eye Centre (SNEC) have been getting longer, from three to four months to six months. It will soon be more than a year, because my doctor is on leave. Yearly check-ups should be for those without eye disease, whereas patients with chronic eye disease should be monitored more closely for deterioration of vision. How acceptable is an interval of more than 12 months between appointments for SNEC patients? Is there such a shortage of doctors that the existing ones cannot cover for colleagues who are on leave? This also implies that a doctor on leave will need to clear a backlog of patients. It is worrying if manpower problems were to affect healthcare quality. Even the waiting time at a clinic or hospital for one’s appointment with a specialist can be around two to three hours. A severe bed crunch at Singapore’s public hospitals has forced several of them into taking some extraordinary measures. Changi General Hospital (CGH), which has 800 beds, started housing patients waiting for beds in a large air-conditioned tent this week. The 1,200-bed Tan Tock Seng Hospital (TTSH), meanwhile, has been forced to set up 49 beds along the corridors of its wards to cope with the demand. Together with Khoo Teck Puat Hospital (KTPH), they have also resorted to sending patients to Alexandra Hospital, one of the few public hospitals here with spare beds. Having taken in more than 900 patients from other hospitals between last September and December, it continues to admit around 11 such patients each day. 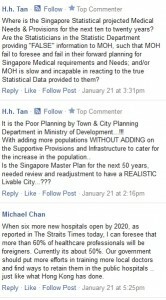 This is despite CGH already renting a ward from Parkway East Hospital and the next-door St Andrew’s Community Hospital. He described the current bed crunch as “abnormal”, since public hospitals usually experience a dip in patients during this period. But numbers went up instead. Dr Chia Shi-Lu, a member of the Government Parliamentary Committee for Health, suggested that the crunch might be due to the holiday season rather than a spike in illnesses. Mr Liak said this was possible. He explained how 20 KTPH patients at any one time refuse to be discharged. Some say their families are on holiday, and there is no one at home to take care of them. Health Minister Gan Kim Yong said last night that he was aware of the problem – hence, the push to add 1,900 more acute hospital beds and 2,600 community hospital beds by 2020. He added: “The hospitals have also implemented various measures to alleviate the bed crunch. Madam Fatimah Beevi, 60, has experienced the crunch at both KTPH and CGH over the past fortnight. She spent Christmas night on a trolley bed in the packed KTPH’s emergency department, where she said the beds were so close she could touch the next patient by stretching out her arm. She was discharged after a day. When her problems persisted, she went to CGH on Sunday. She was placed in the Admission Transit Area for 48 hours while waiting for a B2 bed. “There was no shower room and I couldn’t bathe for two days,” said Madam Fatimah, who was discharged yesterday evening after her condition stabilised.